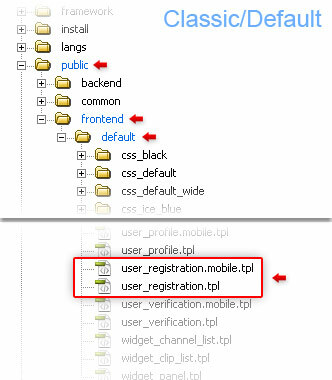 Instructions on how to add extra fields to the Front-End User registration form. 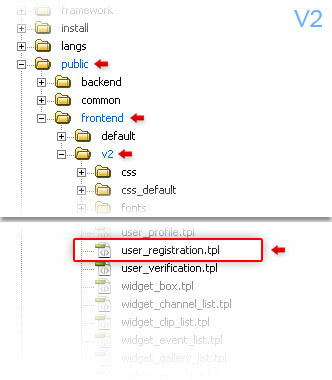 By default, the WebTV User registration form request some basic information to the Users. For most clients, these will be enough, but others may need to request additional information that can be stored into the database. Download the files to your computer and edit them. NOTE: You can use any plain text editor like Notepad, Notepad2, Notepad++, Dreamweaver, etc. When editing the files you fill find several, commented, input fields (all possible fields which can be collected by the form): Simply uncomment the HTML blocks corresponding to the extra fields you want to collect; or do it the contrary: uncomment all blocks and comment the ones you don't want to collect. Upload the edited files to the server (overwriting existing ones) and refresh the WebTV page to see the changes. Besides the aforementioned fields, that can be handled by the WebTV which correspond to the database structure, you can add arbitrary extra fields that can be stored into the admin notes fields.